Throughout my career as a monetary transformer, I have drawn heavily upon the profound and insightful writings of E. C. Riegel (b. 1878; d. 1954). As I wrote in one of my books, I’ve learned more about money from Riegel than from any other source. Riegel left a great legacy of writings and correspondence. That legacy would have been lost to us except for the fact that Spencer MacCallum happened to meet Riegel a year before his death, and recognized the greatness of his work and its importance to the future of civilization – to peace, freedom, and general prosperity.Riegel wrote about all of those things because, as he showed so clearly, they are dependent upon the liberation of the exchange process from the dominance of political and banking interests, and he showed how private initiative and voluntary action could achieve it. Much of what he proposed and tried to implement in the 1930’s and 40’s has been reinvented in more recent times in the form of the mutual credit, LETS, and clearing circles that have been proliferating around the world, along with extra-bank credit clearing offered to businesses by the commercial “barter” industry. But there is yet something incomplete about these. Today’s initiatives could benefit from the deeper understanding and structural proposals that Riegel shares with us in his works. If you want to help financially, you can make a tax deductible donation to Community Information Resource Center, P.O. Box 42663, Tucson, AZ 85733. Mr. Greco: I first came upon you and Mr. Bernard Lietaer on the pod cast, “themoneyfix.org.” Yours and Mr. Lietaer’s insights have influenced my thoughts tremendously! I am particularly interested in two things: One, how does one start an “equity bank or corporation?” and Second, I sent an e-mail to Bill Moyers asking him to have you as a guest along with Mr. Lietaer on his new show: Bill Moyers which currently airs on “The Create Channel” on WQED locally. As an aside, are you going to lecture in Pittsburgh sometime? I would love to listen to your lecture. Your comments on J. K. Galbraith in “themoneyfix” and his description of money were subtly sarcastic and very insightful! What alternative currency system in existence would you say is closest to Riegel’s ideas? Are there any present plans you know of to implement his ideas now? I am looking at all the ways I can find to design a complementary currency system and, like you said, I think Riegel’s ideas are the mother lode. My prescriptions are based largely upon Riegel’s ideas, but also upon those of the German school of free money and banking. The WIR and the commercial “barter” exchanges provide good working models of the credit clearing process. These need to be optimized, proliferated and combined into wide area networks to provide the foundation for the next “convivial” civilization. 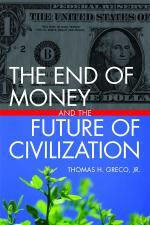 Read my book, The End of Money, and view my recent presentations linked in the sidebar on this site.